During its 2015 tour in the UK, CNPOC brought its production of Warrior Women of Yang and Farewell My Concubine, which was a huge success with the local audience and a highlight of the China-UK Year of Cultural Exchange. In 2016, CNPOC staged The General and the Prime Minister and The Legend of the White Snake in Britain to mark the beginning of the China-UK "Golden Era". This year, with its classic production of A River All Red and The Phoenix Returns Home, the CNPOC will again present the British audience a gala of traditional Chinese culture. 2017 marks the 45th anniversary of the establishment of the ambassadorial diplomatic ties between China and Britain, and it is also a year for consolidating the China-UK "Golden Era". Now it is the time for us to build on our achievements of the past and herald a promising future. The CNPOC's tour in Britain this year will undoubtedly be a new highlight of the "Golden Era". Yu Kuizhi, who played the leading role of Yue Fei with artistic prowess, fully showed the unrelenting loyalty and patriotism of the hero and his sadness and anger for the lofty aspirations unrealized. Li Shengsu staged as Yue Fei's wife has conquered the audience with her elegant and charming appearance and touching performance. The audience, appreciating not only the heroes in Chinese history, but also the patriotism advocated by the Chinese nation over generations, was overwhelmed by the artists' wonderful performance, and they gave the artists long and warm applause. After the performance, Charge d'Affairs a. i. Zhu met with all the performers and expressed his sincere thanks to Vice President Yu Kuizhi, Troupe Head Li Shengsu and all the other artists, and his congratulations on their success. 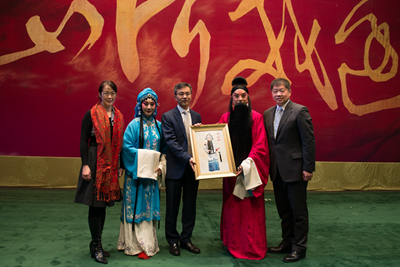 Zhu said that, CNPOC' visits in the past three years have not only presented the charm of Peking Opera to the British audience, but also spread the spirit, cultural tradition and morals of the Chinese nation, adding "Golden Fruits" to the "Golden Era" of China-UK relations. Zhu was accompanied by Xiang Xiaowei, Minister Counsellor for Culture of the Chinese Embassy at the premiere. The 65-people troupe from CNPOC visited the UK from October 19 to 27, 2017, and staged 4 performances at the Sadler's Wells Theatre in London. Peking Opera A River All Red was a 1960s adaptation of the historical story of Yue Fei, a national hero in the Song Dynasty, by CNPOC masters including Li Shaochun, Yuan Shihai and Du Jinfang. 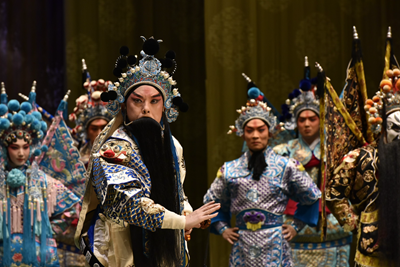 It is one of the classics of the Peking Opera, known for its heroic scenes and splendid artistic style. 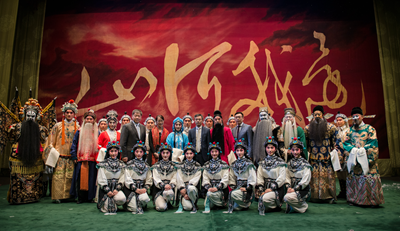 Yu Kuizhi, an influential opera artist, has been studying Master Li Shaochun, together with other CNPOC members, developed the current production in 2010.